Firefighters work to extinguish a field fire on March 6 last year at a property on U.S. Route 50 near Hoagland. The fire was reportedly caused by a burning couch. 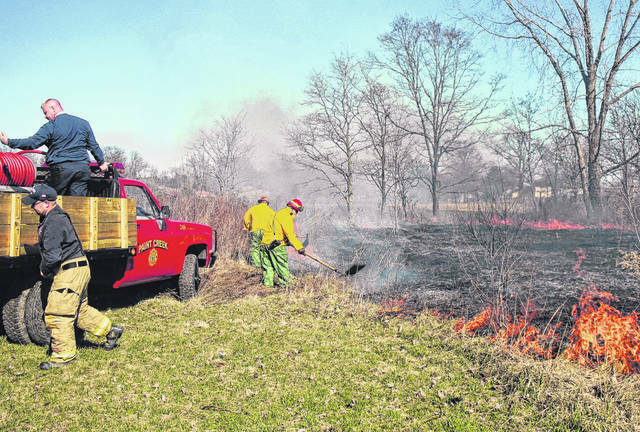 The Ohio Department of Natural Resources has expanded a forest fire protection area to include all of Highland County, and Rocky Fork State Park Natural Resources Officer Adam Somerville said that observing the burn season laws and times is more important than ever. State law prohibits open burning during the spring months of March, April and May, and in the fall during October and November between the hours of 6 a.m. and 6 p.m. daily. Somerville said doing so is considered a third-degree misdemeanor, and if someone is charged and convicted, they could face up to 60 days in jail. He said because of the expansion of the Wildfire Protection Area, local fire departments have access to resources from the Ohio Department of Natural Resources Division of Forestry. According to Somerville, the forestry division can bring in bulldozers that cut a bigger fire line in a single pass than 20 individual firefighters wielding only rakes and shovels. Originally drawn up in the 1970s, the ODNR’s Forest Fire Protection Plan was designed to foster successful forest management activities. Somerville said because of that, forest cover throughout Ohio has increased and brought with it the need to expand the Wildfire Protection Area to 43 counties. An ODNR news release said the expansion will also provide more rural fire departments with the ability to call on forestry personnel for assistance when wildfires occur in their areas. The expanded Wildfire Protection Area contains and land covered by approximately 580 fire departments in the 43-county zone, the news release said, which is a significant increase from the nearly 325 fire departments it included prior to the expansion. The news release added that all of the fire departments within the Wildfire Protection Area have the opportunity to partner with the ODNR Division of Forestry, and that they may become eligible for grants, equipment assistance programs, enhanced training and mutual aid in the event of a wildfire in their service region.